Direct Plans vs Regular Plans : What does it mean and why should you care? Each Mutual Fund scheme has a Direct Plan and a Regular Plan. If you invest in Mutual Funds through a broker or a distributor, you are investing in Regular Plans. All distributors like Scripbox, MyUniverse, Fundsindia, ICICI Direct, Bajaj Capital etc provide only Regular Plans. But when you invest through the Mutual Fund directly or take the help of an advisor like Kuvera , you invest in Direct Plans. 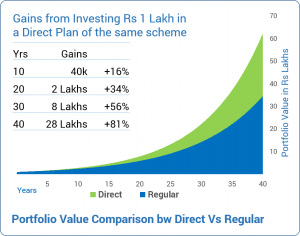 All Direct Plan mutual fund schemes require the word “Direct” or “Direct Plan” to be clearly mentioned in the scheme name. Always look for or ask for this in your portfolio statement. Regular Plans pay commissions to the broker or the distributor. This commission is added to the expense ratio of the scheme. So these plans have a higher expense ratio as compared to Direct Plans that do not have commission expenses. Regular Plan commissions can amount to as much as 1.5% of the AUM(the value of your holdings) as commission from Mutual Funds, every year! When brokers tell you their advice is for free, it isn’t. Because you pay a heavy price (commissions and advice biased by commissions) for it. In effect, regular plan investments give you lower returns as compared to Direct Plans because of these commission expenses. Obviously, a broker will never help you or advise you to invest in Direct Plans. In short, if you invest in Direct Plans, the same schemes will get you better returns. Direct Plans will help me save 1.5% commissions every year.. that’s not much! We assumed a 12% Return on investments and a Total Expenses Ratio of 1.0% for Direct Plans and 2.5% for Regular Plans. But my broker provides me advice. It’s OK if he earns some commission. Is that wrong? Yes, it is. Because the commission is paid by the fund house and not by you directly. Whose interest will the broker work for? Isn’t there a conflict of interest when the broker has to make a choice between the scheme that suits your risk profile and objectives vs a scheme that pays attractive commissions? Agreed, Direct Plans are better, but how do I choose which Funds to invest in? You can visit kuvera.in and try our Financial Planning Solution here. We do your risk profiling and goal planning to build a detailed financial plan. And recommend which Mutual Fund schemes in which you should invest. We have used our years of Investment Management experience to develop a scientific and disciplined approach to investing. Importantly, we are a Direct Plan only platform so our advice is never biased by commissions. Still you are saying that it’s FREE (or ZERO) on your “pricing” website. I’m looking for a single view portfolio site – as you offer “Direct Plans”, how are running the business without getting by both customer and MF AMC. We don’t need your business earning model – but, interested to know how the customer is directly or indirectly charged. does this mean.. you sell our data? We have lot of respect for what you do and what you are trying to break. But we really want to know how you earn in lay man’s words. Will my data be at disk by sharing it or placing it in kuvera? Will you share my email id and phone numbers? We have made it clear enough times, we will never sell your data. Do I Need to invest online only using your website by myself ? Or Any of your Marketing Executives meet me in person and help me get all the documentation done in physical and collect investments cheques from my place . Hello Puja, no paperwork or cheques are required. The entire investment process can be done online through your internet banking account. is it safe investing through a website, without having any physical interaction with anybody and without any paperworks? what if after few years the website becomes invisible? how do i get my money back then? Dear Kinshuk, thanks for asking us the above. It is totally safe to invest through a platform without any paperwork. All your transaction records, which used to be stored as paperwork earlier, are stored as digital files with central registrar agencies such as CAMS and KARVY and also with all the Mutual Funds you invest in. Your money is always invested in your name and you can always sell your funds and withdraw that money directly with the Mutual Funds company. We will give you all the information necessary to sell your funds and withdraw your money, either it is through us or directly with the Mutual Fund company. Yes Bharath, you invest in funds managed by Mutual Fund companies such as HDFC or ICICI. We have 30+ such fund hosues on our platform and you can invest in them directly through us. As you said, Advisor may recommend the funds which will have high commission. Won’t SEBI have control on deciding the commissions for MF houses? I don’t think it will be in MF houses control. i am getting difficulties to do direct mutual funds -because of KYC. Yes, Suryabhan you will have to update your KYC as NRE. It is mandatory to mention NRE or not. I have recently invested with a small company (a friends’ startup) with a similar offering as the other ones you mentioned above (Scripbox, etc.) and I have invested north of 25L plus SIPs in multiple MFs. How easy will it be to switch to you, in case I decide to go down that path? NAV for Direct plan is higher than Regular , so the purchase price is also higher. Does the customer really benefit? STCG stands for Short Term Capital Gains. For equity funds these are taxable at 15% of the total short term capital gains. Why is it that you talk only about direct plans of mutual funds as a means of wealth creation? No talk of complete portfolio management? We do talk about complete portfolio management as well. We just emphasize on using Direct plans in achieving it. I want you to contact me on my on my m.no.9518561536 I want to invest in lumsome AMT. Why do you say that your services are absolutely free when Kuvera charges approximately Rs 2,500 of yearly fees, once the investment through the platform crosses a lakh ? You can also read more here https://kuvera.in/pricing . We are very transparent about our pricing. What you see is what you get. Was searching for such a platform. Was finally redirected here via an answer on Quora. Frankly speaking, I never heard of Kuvera before. Doesn’t Kuvera advertise itself much? Brokers like Sharekhan, ICICI etc. are the only ones well known to the general public. I suggest that you should advertise your platform in some way or the other because it’s a really investor friendly platform where you charge no fees for investments in direct funds. Really appreciate that. Kudos to such a platform! I have MF investments North of 2 lakh in regular plans via Sharekhan. Can I import them to Kuvera? If yes, then will I have to sell off these investments and reinvest in Direct plans via Kuvera? How long will the entire process take? 1.Sell your demat units and then buy them directly from Kuvera. 2. Ask Sharekhan to rematerialize your folios so you can import them to Kuvera following the steps in the “Import Portfolio” screen. As a first step, your should stop your demat SIPs and start the same SIPs on Kuvera to stop accumulating more demat units. 1. Currently I invest in regular mutual funds through another platform that automatically monitors growth and suggests new funds, when the current returns are not on track. Does Kuvera offer something similar? Will you suggest me a better plan, while investments are in progress and the current funds do not perform as expected? 3. How else can i use smart switch, if i don’t have enough coins to avail it? is there an option to pay for this service? 1. Yes, we update our recommendations as markets change. We will advice you accordingly but you will have to decide to execute on that advice or not. 3. Right now Coins is the only way. We find a simple “Whatsapp” share easily gets most user 1000+ coins. Hope it helps. Also not [email protected] is a better channel for queries like this for a prompt response. I have a demat account in Axis bank..I.e. Axis Direct. 3 Sip run through it for 9months. How can I switch this sip from regular to direct through kuvera. 2. Ask them to rematerialize your folios so you can import them to Kuvera following the steps in the “Import Portfolio” screen. As a first step, you should stop your demat SIPs and start the same SIPs on Kuvera to stop accumulating more demat units. How does your SIP work ? Is it SIP or lumpsum buying at the regular intervals? My concern is what is lumpsum buying is stopped from Fund House and only SIPs are allowed? It is a true SIP. It is not periodic lumpsum investments. Even if fund house stops lumpsum investments, your SIP at Kuvera will continue. Are you also help to track my EPF, NPS and PPF accounts here? I just want to know if I can track all my investment under one app. Not yet, but this is in our roadmap. Is facility of systematic transfer from a Liquid mutual fund (Lump sum deposited here) to an Equity mutual fund of same fund AMU possible? am having two portfolios with kotak and fundsindia. How can I switch to Kuvera? After logging in, please follow the steps in the Import Portfolio tab. Do read the “Import Portfolio” FAQ at the bottom of the page as well. If I import my portfolio to kuvera, and start SIP or do a lumpsum purchase, can I log into my AMC login and see thee same number of units as Kuvera? And if I do transaction there, will that also be synced with Kuvera. Whether buying or selling…? Yes, you can use your folio and login details to track on the AMC site too. Yes, no fees regardless of portfolio value. Since we are Direct Plan only so no commission ever as well. Hi, I have couple of SIP orders invested in direct mutual funds through Zerodha-Coin and wanted to import them into Kuvera. Can you guide me with the steps? Kuvera is a non-demat platform and zerodha coin is a demat platform. Bear that in mind as you read further. 1 Subject to exit load, lock-in and tax considerations, you can sell your demat units through zerodha. Once sold, your zerodha account can be closed. Then place fresh purchase requests on Kuvera in the same schemes. Ps: just importing your portfolio today (following the steps in “Import Portfolio” tab) will not close your demat account with zerodha. Further orders placed from demat folios on our platform will get reversed by the AMC. You will have to convert the units from demat to non-demat using one of the steps above. Let us know how it goes and if we can help in any way. How are your different from coin of zerodha. Other then in nondemat form of yours. 1 Login. All the features. That is what differentiates us. We understand investing and investor needs, so we have features and processes in place that make investing easy. If I make a smart switch from regular to direct, will my running sip be close/stop, or it will continue as direct plan. You will have to stop existing SIPs in regular plans and start Direct SIPs in same folio on Kuvera. Your collected units will be regular plan units till you switch them to Direct plan on Kuvera. Dear Gaurav, I have been investing in MF’s through ICICI direct all these years. is there a possibility of me importing those funds to Kuvera if I start an account and switching the same to direct funds? advice. Hope the above helps. Let us know if you get stuck on any step. I have my direct mutual fund account in Paoisabazaar.com…. i am tired of his services, please help me. I hold “direct” MFs from Aditya Birla Capital, Franklin Templeton, HDFC, ICICI, UTI, and AXIS. My investment is large. I invest for a long-term and always do a lump sum. So obviously I have separate logins for each AMC. I am also able to get a consolidated statement from CAS which has the breakdown of all my MFs in one document. The only requirement I have is to view my MF portfolio in one screen with all the analytics of profit/loss and return. 1) Through import function on Kuvera, I will be able to view all the direct MFs on one screen and with all the analytics that I could on an AMC website, correct? 2) After I import on Kuvera, my AMC portfolio and logins will stay as-is, correct? There will not be any change in what I have today and what I can do through AMC website, correct? Yes Jimmy, you are right on both counts. 1/ Through import you will be able to see consolidated portfolio on Kuvera. 2/ You can always access those folios from the AMC site. if we start an SIP in kuveera after 10 or 15 years if i want to withdraw my money along with the interest earned do we need to pay while withdrawing to kuvera ?? No Swaroop, there is absolutely no charge for redemption either. I am investing lumpsum amounts on fundsindia for the past few years. 1) How can I import those plans into your’s? 2) After I import it, will it become a direct plan in Kuvera? or it will be just a replica of fundsindia data while it is regular plan there? Thousands of investors have successfully moved their portfolio to Kuvera to save on regular plan commissions and to take advantage of our advanced investing features. START your direct plan SIPs on Kuvera in the same folio as your current plans and then STOP your SIPs with other platforms.